Thick oil from the BP Deepwater Horizon oil spill floats on the surface of the water in Bay Jimmy near Port Sulphur, Louisiana in June 2010. British energy giant BP is prepared for a multi-billion-dollar US legal case into the massive Gulf of Mexico oil spill to last until 2014, its chief executive has told the Sunday Telegraph. 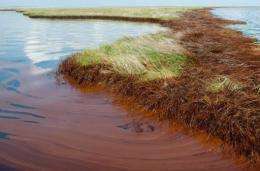 British energy giant BP is prepared for a multi-billion-dollar US legal case into the massive Gulf of Mexico oil spill to last until 2014, its chief executive told the Sunday Telegraph. The London-listed company heads to a US court on Monday in an attempt to determine how much it owes for the oil spill catastrophe and how much it can shift to subcontractors. "We have to remember we are a business that invests in decade-long cycles," BP chief executive Bob Dudley told the weekly newspaper. "If (the trial) goes to 2013 or 2014, in the history of BP and the way the energy industry works, we just have to think much longer term. "Hopefully we will reach some agreements and we will be able to reduce the uncertainty and move forward. "But the appeals process has various different branches it could go down in terms of time, so it could be a lot longer than that (2014)." Dudley added that that group had overhauled its safety procedures since the 2010 disaster. "I think we are now using the toughest standards in the world for floating drilling rigs everywhere," he told the Sunday Telegraph. "People realise we are serious. I believe that you cannot come out of an accident like this without a sense of responsibility to change. I do believe the offshore industry will change, just like in any industry after you have a terrible industrial accident." The April 20, 2010, explosion on the BP-leased Deepwater Horizon drilling rig killed 11 workers, blackened beaches in five US states and devastated the Gulf Coast's tourism and fishing industries. "Several government probes have castigated BP, rig operator Transocean and Halliburton -- which was responsible for the runaway well's faulty cement job -- for cutting corners and missing warning signs that could have prevented the disaster. constitute gross negligence, how much of the blame rests with each party and whether punitive damages should be imposed." Of course there was negligence. ANY shortcuts or attempts to advance through the process without verification of successful completion of the previous step --especially under those conditions-- is, by defininition, RISK, and under the circumstances, very clearly constitutes negligence of duty. I'm behind schedule getting to a very important meeting. Triply so, because I'm driving the carpool that also comprises two other members of the working group that are essential to the purpose of this meeting. They keep telling me to "Step on it! ", and "To hell with the speed limit--we've got to be there in three minutes!". The Trooper hits his lights when he clocks me at 75mph.